What is the Christian flag, and what does it symbolize? Question: "What is the Christian flag, and what does it symbolize?" 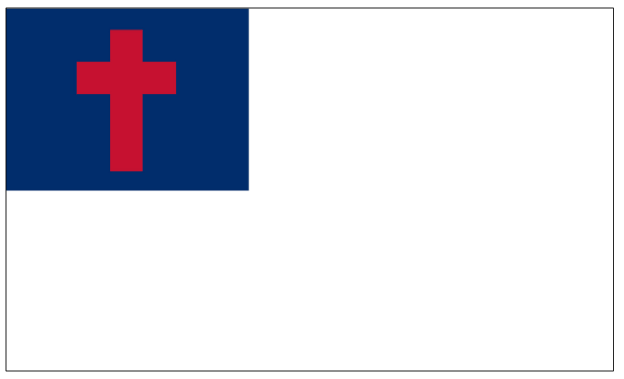 Answer: The Christian flag has a white field with a blue canton (a rectangular area in the upper left corner). Inside the canton is a red Latin cross. The Christian flag is designed to be universal, representing all of Christianity without regard to denomination. The Christian flag is often displayed in Protestant churches and Christian schools in North America, Latin America, and Africa. The origin of the Christian flag can be traced to a Rally Day meeting at Brighton Chapel in Coney Island on September 26, 1897. When the scheduled speaker did not show up, Sunday School Superintendent Charles Overton stepped in to give an impromptu lesson. Since there was an American flag close to the podium, Overton discussed patriotic symbolism. As he spoke, he had an idea: why should there not also be a Christian flag with spiritual symbolism? Overton designed the flag on the spot, giving his audience a verbal picture of what such a Christian flag might look like. A few years later, Overton enlisted the aid of Ralph Diffendorfer, secretary to the Methodist Young People’s Missionary Movement, to actually produce a flag based on Overton’s idea. We can interpret the colors and symbols of the Christian flag as follows: the field is white, representing peace, purity, and holiness. The blue canton is emblematic of loyalty and truth (and possibly of heaven or the waters of baptism). The cross in the center of the blue canton is, of course, a symbol of Christ and His work of salvation; the cross is red, typical of Christ’s shed blood. Taken together, the symbols of the Christian flag portray the basics of the faith: Jesus Christ, the Holy One, died on the cross to grant us salvation, and we serve Him in fidelity and holiness, as He is faithful to us. With earnest hearts we pray. Who died to make us free. Good will and peace to men. The Christian Flag! God bless it! There is nothing sinful about displaying a Christian flag or reciting a pledge to it. Given that the Christian flag and its pledge are designed to honor the Lord Jesus, having the flag in a church or school can be a wonderful reminder of Christ and our commitment to Him. The Christian flag’s emphasis on the cross is biblical, since God, through Christ, worked “to reconcile to himself all things, whether things on earth or things in heaven, by making peace through his blood, shed on the cross” (Colossians 1:20). At the same time, the Bible nowhere advises us to make Christian flags or gives us wording for a pledge. Since the Christian flag is a manmade design, displaying it or pledging allegiance to it is a matter of conscience and not required of any Christian. What are the core beliefs of Christianity?